More often than not, designers have to compromise on their vision and conform to what the client or creative director wants. “Make the logo bigger” is one of those phrases designers will hear at least a thousand times in their career. But true creatives just create because they love the art of creating. In those times, it’s nice to have a little pick me up, to remind us of what truly matters. 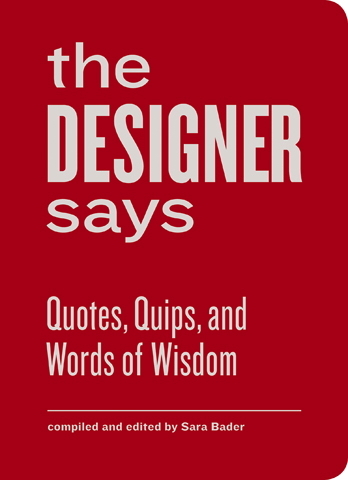 Sara Bader has complied a list of quotes, quips and words of wisdom, in one lovely reference book: The Designer Says. Published by Princeton Architectural Press and distributed in Canada by Raincoast Books, this compendium of insights from over one hundred of history’s leading graphic minds, is a delightful must-have book on every designer’s shelf. The Designer Says is a perfect pick-me-up on a day when you’re feeling down and wondering why you ever got into this crazy, demanding industry. It will give you a smile and inspire you to never give a damn what anyone says. You are your own worst critic. Just keep on designing. IF IT IS TOTAL RESISTANCE.